Need More Space? An Organized Closet Can Help! | 41 Lumber - Serving Iron Mountain and the U.P. It doesn’t take long to fill up a closet. Though we often start with the best of intentions, keeping closets organized can be quite a struggle. There are many reasons why closets get away from us. Our schedules get a lot of busier, families grow and our lifestyles change – sometimes, with all this going on, it’s easier to just close the doors for now, and get on with the day. Often, the result is overflow into the rest of the house as free closet space begins to shrink. With proper organization, it’s amazing how much can actually fit into a closet. What’s more, with all of the modern storage systems available, you’ll be able to fit a maximum amount of stuff in your closet while still being able to access it easily. All it takes is a little planning and discipline. The first step is to decide what really belongs in the closet. There’s a golden rule of closet organization: if you haven’t worn it in a year, then toss it. Take the time to go through all of your old clothes and decide what you really need. Clothing that doesn’t fit can be donated or stored in the garage or attic for your next yard sale. If you have a large volume of clothes that you can’t part with, then you may need to resort to rotating clothes by season. 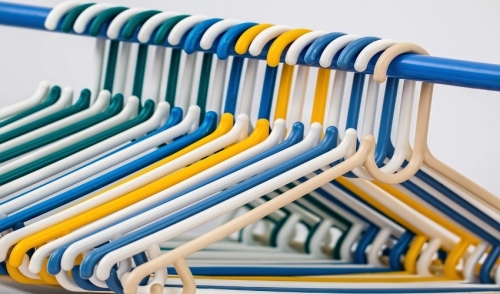 Purchase covered clothing racks that are suitable for storing in the attic or basement to keep your off-season clothes in. Keep the most commonly used things at eye level. When hanging one row of clothes above another, keep the shorter clothes on the top bar. Be mindful to leave as much space available at floor level to use for such things as shoe racks. Smaller items can be kept in clear storage boxes and placed on shelves. Some of your closet overflow can still be kept in flat storage boxes, designed to fit under your bed. The most effective way to use your closet is to only keep the things that you need most often in it. For things that are rarely needed, consider storing them in either the attic or the basement. Consider using space saving hangers, which allow for multiple items to be hung on one hanger, maximizing the vertical space.